Large villa sleeps 6/8 comfortably, with large private outdoor pool and garden, including outdoor dining furniture. 15 minutes from Bourgas Airport, and 5 minutes by car/bus to local beaches. Authentic Bulgarian BBQ situated beside the pool. Situated in the Vineyards Resort, which boasts a hotel with health spa. 2 Restaurants and 2 pools onsite, one with outdoor bar. Playground and animation team for summer months. We first visited Bulgaria in 2006, and really enjoyed the weather, the food and the people. We bought our villa in 2008 and have spent many weeks a year holidaying there. We bought in the Vineyards resort as it is close to Bourgas Airport, and built to a very high standard. Our villa is very peaceful, whilst allows us meet other families with similar interests. Our private pool allows us relax and spend time as a family. The complex has enough facilities onsite, but is not overcrowed with bars and restuarants. 2 en-suite bathrooms (upstairs) each with bath, shower and WC. 1 Bathroom (downstairs) with shower and WC. Spacious living room with coffee table, sofa (pull out double bed), armchair, fire-place, TV, DVD, patio door leading to spacious outdoor terrace (including outdoor dining table and chairs (seats 6). Main kitchen equipment, including mini bar, dining room table and chairs (seats 6), cooker, hob, fridge and freezer, microwave and toaster. Air conditioned. Patio door leading to veranda over looking pool. Notes on accommodation: Set in a gated/secure complex. Non-smoking indoors. Shops and nail bar onsite. Full use of the Hotel facilities including Helath,spa and beauty center. 2 Outdoor swimming pools and small playground. Outside: Landscape garden (sun loungers) with veranda and terrace (outdoor dining furniture). Off road parking. Authentic Bulgarian stone BBQ. Private swimming pool with outdoor shower. Utility Room: Washing machine, iron and ironing board. Cleaning / Towels / Linen / Maid service: Towels and Linen included. Change of towels and linen at start and end of rental cycle. Great villa...had everything we needed. Very clean place and grounds well maintained. Delighted you had a great holiday. 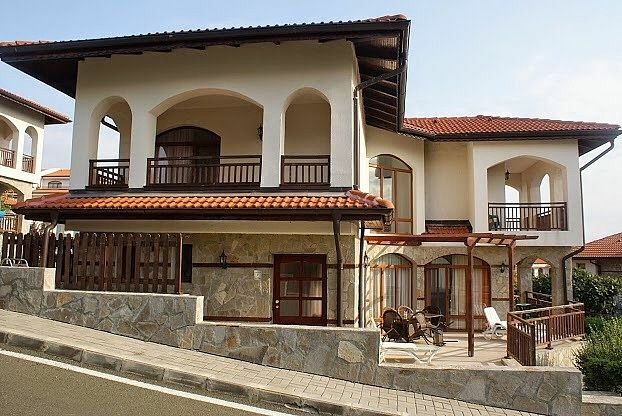 Thanks again for booking our villa for your holiday in Bulgaria. Our first time in Bulgaria but we will be going back. The house we enjoyed was well above our expectations, very clean and well presented with excellent facilities. You would struggle to find anything so well put together anywhere else. The pool is very big and a good depth. The features inside do not disappoint - comfortable lounge, good beds, big bathrooms and excellent hot shower room too. The site is very quiet which we liked - if you want loud busy night life the Sunny Beach resort is a short bus or taxi ride away. Food and beer are cheap - even in the big posh hotel on site. The pools are not heated but the sun shines on you anyway. The hotel has a good pool table that is never too busy and there is a very good heated indoor pool at the spa hotel with sauna, jacquzi, hot tub etc. for a very reasonable all-day fee (less than £30 for 4 of us and we were in and out all day long). The taxi drivers are mad but a local ex-pat taxi firm got us to and from the airport at a good price, organised through the owner. Above all, the place is beautiful, peaceful and safe. Aldi supermarket near by and a good local shop on site are very cheap but few brands we would recognise. We did not have a car and we managed well. People were friendly though less inclined to speak English than many other European places. No dog or insect problems at all, despite the heat - we had read about some on line. Advise you take your own DVDs as the TV is very Bulgarian.... even the few satellite channels are nearly all foreign output. We had NO regrets at all about this place, the villa, the country or the enclosed site. Try it and I am sure you will find the same as we did. We loved it. Approx. 5-10 minutes drive to a range of local beaches. AcquaPark is approx. 10 minutes drive. Bourgas Airport is approx. 15 minutes by car. Car hire is recommended for those wishing to visit the beautiful sandy beaches on the Black Sea Coast, although public travel is available. Aheloy and Ravda are both approx. 5 minutes drive (each with their own beach, retuarants shops and town). Nessebar is approx. 10 minutes away (beach, town shops and local restaurants). The villa is fully equipped and part of a hotel complex which is self contained. The villa provides a relaxing holiday, yet all the night life of Bulgaria is close by (car/bus or taxi). Booking Notes: A €100 per week of stay, non refundable deposit is required to secure your booking, and is payable by bank transfer or cheque. Balance must be paid 4 weeks prior to departure (unless it is a last minute booking when full rental amount is due on booking). There is also a security breakage deposit of €100 per week of stay which is refunded following your stay, on confirmation that there are no damages/breakages. Wi-fi is available and included in rental price in the villa, garden and terrace. Notes on prices: Wi-fi, cable TV, electricity usage and water usage are all included in the price.